Kohl's Is Way Past Its Prime: Can It Adapt? Kohl's is struggling to find its way in a new no-growth environment. Not too long ago, Kohl's (NYSE:KSS) was a retail juggernaut, disrupting the market and profiting from the decline of the American mall. Today, Kohl's is just one of the many department stores being disrupted by the phenomenal rise of Amazon.com (NASDAQ:AMZN). As a result, Kohl's stock has lost more than half of its value since early 2015, and is well below its level from 10 years ago. 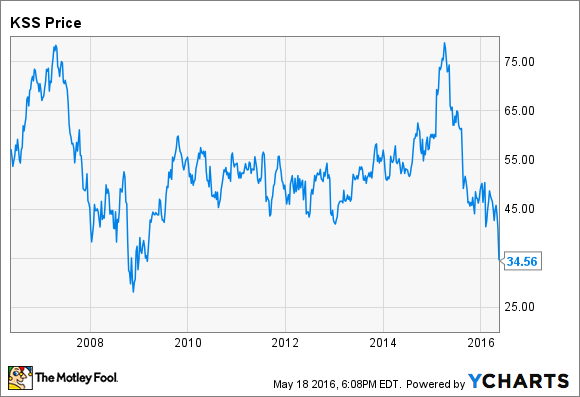 Kohl's 10-Year Stock Performance, data by YCharts. Based on Kohl's stagnating sales, it's clear that the company is past its prime. The key question for long-suffering Kohl's investors is whether it will be able to adapt enough to drive a recovery in the stock price. The company's recent Q1 earnings report provided mixed evidence on this front. 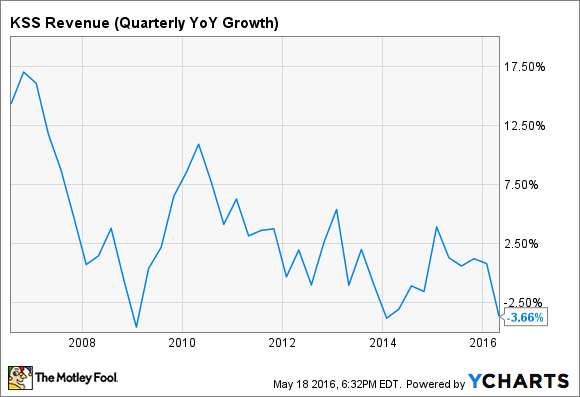 A decade ago, Kohl's was posting consistent double-digit revenue growth. Even five years ago, sales were rising at a healthy rate. But for the past few years, sales trends have fluctuated around the flat line. Kohl's long-term growth was driven by a combination of low prices and convenience. It built its stores in strip malls and high-traffic stand-alone locations that are close to where its customers live and work. Furthermore, its stores have a single-floor "racetrack" design with a central checkout area in the front of the store, compared to the confusing layouts found at most department stores. That's not enough for Kohl's to stand out anymore. Today, the convenience of a Kohl's store pales in comparison to the Amazon.com shopping experience. With Amazon, you can order from the comfort of your own home, and your purchase will show up two days later -- or, in some cases, within hours. This has driven Amazon's massive growth in the clothing/fashion industry. Amazon appears to have huge upside in the apparel business. In recent years, it has brought in key national fashion brands while also launching a slew of new private-label brands. As a result, investment bank Cowen & Company expects Amazon to become the No. 1 clothing retailer in the U.S. by the end of 2017. Kohl's posted comparable store sales declines of 1.2% and 0.3% in the 2013 and 2014 fiscal years, respectively. However, it finally seemed to be regaining momentum last year, as comp sales turned positive again. In the past few months, investors' hopes for a sustainable recovery have been dashed. Kohl's missed its sales growth guidance in Q4 2015 and then posted a 3.9% comp sales decline last quarter. In light of these deteriorating trends, Kohl's is closing 18 stores this year, marking its first-ever batch of large-scale store closures. From a sales perspective, e-commerce has been one of the few bright spots at Kohl's recently. Like many other department stores, Kohl's is seeing double-digit growth online. But even that is a mixed blessing, as online transactions are much less profitable than in-store sales. The good news for investors is that Kohl's was able to modestly reduce its operating expenses to protect its profitability last quarter. Management indicated that the company has additional opportunities to cut costs and operate more efficiently. Kohl's management also has high hopes for its ongoing initiative to "localize" store assortments. This is a tactic that has served Macy's well in recent years. However, in light of the changing retail environment, Kohl's may need to take more drastic actions. This year, the company is piloting several new store concepts, including smaller-format Kohl's stores, a chain of off-price stores, and outlet stores for the Fila brand. The latter two initiatives face uncertain prospects, as the off-price/outlet store market is starting to become very crowded. The small store concept is more promising, though. These 35,000-square-foot stores would be less than half the size of a typical Kohl's location. This will allow Kohl's to expand into markets that lack the space or the demand for a full-size store. Just as importantly, if the 35,000-square-foot pilot stores are successful, Kohl's could downsize many of its existing stores in the coming years. That would allow it to cut operating costs while maintaining a broad store base to use for "omnichannel" efforts such as buying online, picking up in store and shipping from store. Kohl's faces an uphill battle to get sales growing again. However, even flattish sales could be enough to get the stock back on track. Kohl's still generates strong cash flow, and cost cuts should help it continue producing cash flow even with relatively stagnant sales. This is allowing Kohl's to return buckets of cash to shareholders. Kohl's dividend yield has ballooned to 5.8% based on its recent stock price. Meanwhile, it plans to buy back $600 million of stock this year: enough to retire about 9% of its outstanding shares. If Kohl's can just sustain sales and earnings at today's levels, shareholders will do very nicely.